In last week’s sermon, Father Jim reminded us of the tension that inhabits this season of Advent. We prepare to celebrate the birth of Jesus, an historical event that prophets foretold would bring about an age of peace and understanding, when swords would be beaten into plowshares, when lions would lie down with lambs, when nation will no longer rise against nation. Then we turn on our televisions, open up our newspapers or browse the internet and we are bombarded with information that reminds us over and over that the prophecy still remains unfulfilled. We look back. We look ahead. And, somehow, we try to figure out a way to connect the two while living in the here and now. Then in today’s Gospel reading, along comes about as unlikely a guide as you could imagine whose purpose is to help us make that connection. He is so unlikely that Matthew feels it is important to describe both his physical appearance and his diet–one of the only times that we are told such details about a participant in the Gospel story. John the Baptist cuts as strange a figure today as he would have back in first century Judea, with his camel’s hair clothing and diet of locusts and honey. 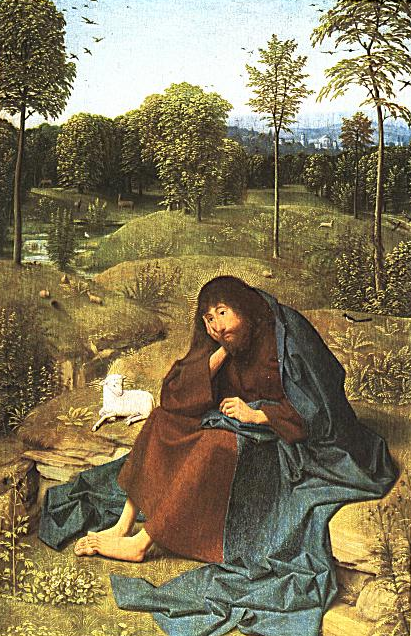 Geertgen tot Sint Jans (c. 1465 – c. 1495): Johannes de Doper in de wildernis (John the Baptist in the Wilderness), circa 1490. I always imagine him as the first-century equivalent of a modern street preacher, standing on the corner, warning passersby that the end of the world is near. Our first inclination is to cross the road and view him from a safe distance. But if we’ve been paying attention, we know that God makes a habit of choosing some pretty unlikely people to make a difference in this world. So we need to stop and listen to John. But what is he crying about in the wilderness? What can John the Baptist tell us about the Second Coming as he anticipates the First? After all, the kingdom of heaven is no closer for John in first century Judea than it us for us in twenty-first century central New York. For John, and for us, the kingdom “has come near,” but has yet to arrive. The key to John’s message to his contemporaries and to us lies in the very first word out of his mouth: “repent.” It is a word that we are all familiar with, yet it is a word that means different things to different people. Some–perhaps many of us–think of repentance as a process whereby we look back over part or all of our lives and identify those things that we have done wrong. We reflect on our sins “of thought, word and deed,” those things we have “done and left undone,” to borrow from the Confession in our own liturgy. From there, we ask forgiveness, from God, from each other, even ourselves, in order that we may start over. It is a moment of change, of growth, of straightening our own paths and preparing our own ways so that we can open ourselves up and receive God’s mercy and love. For others, the process of repentance is very different. It involves a complete spiritual awakening, a profound change in our way of seeing the world, of seeing others, of seeing ourselves. It is the moment when we reach enlightenment and abandon our old ways of thinking and doing. We see this time and time again in The Bible. It is the moment Moses experiences on Mount Horeb, when he encounters God in the burning bush. It is the moment Paul experiences when he encounters God on the road to Damascus. It is embodied by the very life of Jesus himself–the moment when God becomes human and a human becomes the divine. And this is what we will be celebrating in just a few short weeks. Whichever definition we subscribe to–and John, in today’s Gospel, makes no distinction between these two different meanings of repentance–the end result is one of total and complete change, spiritual and mental. When we repent, we turn from our old ways of thinking and doing and we enter a new and deeper relationship with God. But that is just the beginning, as what happens once we have gone through the process is equally, if not more, important. Because when we think we have finished our spiritual journey, when we repent and finally encounter God, our journey has really only just begun. We cannot simply sit back and think our work is over. We cannot keep our experience to ourselves. We have to share our newly acquired gift with the world, especially with those who find themselves in the kind of need that we once found ourselves. This is why, in today’s Gospel, as the people of Jerusalem and Judea flock toward John to be baptized, John turns to one specific group, the Pharisees and Sadducees, and angrily tells them to “bear fruit worthy of repentance.” For them, repentance is an end in itself. They rest on their laurels, content that their spiritual heritage as descendants of Abraham is enough. For all their theology and spiritual understanding, their faith remains fossilized, about as useful as a stone or a barren fruit tree. But scripture tells us in no uncertain terms that repentance is not a noun. It is a verb. So we see Moses descend from the mountain and give the Israelites the gift of freedom from Egypt. We see Paul return to Damascus and give us the gift of the church that we experience even today. And we bear witness as Jesus returns from death to give us the gift of life. Of course, for most of us the fruit of our own repentance grows on a much smaller scale. But that does not make our fruit any less important or any less profound. Whenever we open ourselves up to a new way of understanding, whenever we encounter God in our own way, we, too, have been given the fruit of repentance. And that is a gift that we should not, we must not, hide from the world. The fruit of our repentance must be shared willingly and freely with all. Last week, Father Jim concluded his sermon by asking what we can do to bring about the Second Coming and if, in fact, the Second Coming is a literal event at all. I cannot answer the last question. I am not sure any of us can. But I do know that if our own repentance bears fruit, and if we return from our own spiritual journeys ready to share that fruit, whatever it may be, with those who need to be sustained by it, then we will at least have prepared the way. This entry was posted in Grains of Sand, Sermons and tagged Advent, Jesus, John the Baptist, Moses, repentance, St. Paul, the second coming. Bookmark the permalink.